A highway is an autobahn is an autostrada, to paraphrase some poet of note, so I can't say a great deal about the drive from Pordenone down to Lucca, save that it was at high speed, and very much resembled a drive through any rural countryside, punctuated by occasional transits of cityscapes. We arrived in Lucca, a city north of Pisa, around rush hour and got checked into our room at the Hotel Principessa, a marvelously lucky find on the outskirts of town in the Tuscan hills. The hotel was first built as the villa of a Duke of Lucca just short of 800 years ago, and has seen a number of transformations, and it is located in beautiful gardens, furnished in classic opulence, very peaceful. We took a bit to freshen up, then headed into town, determined to do a bit of exploring, then to have a meal at the restaurant of two friends of our hosts, but our well laid plans went a touch astray. We barely cleared the city walls. Joe and Mindy introduced us to their friends Michael and Anita, who run the strategically located Lucca in Tavola, and began one of the most amazing meals I have ever experienced. Our new friends visited our table beside one of the main pathways to the interior of the walled old city with their recommendations and commentary on a feast which began with crostini covered with Laredo and Tartuffe, continued through a meat and cheese platter of salami, capaccio, pecorino, prosciutto and olives. The ladies had rolled sole, stuffed with prawns and spinach, Joe had a perfectly cooked sirloin, and I ended up with home-made tagliatelle pasta, smothered with mussels, clams, and calamari and flanked by a pair of amazing shrimp. All of this was accompanied by flights of prosecco and Chianti, punctuated by an encounter with a marvelous Australian couple celebrating their 50th wedding anniversary (who may join us for dinner tonite, as well) and topped off by special baked desserts filled with Chantilly cream and strawberries. 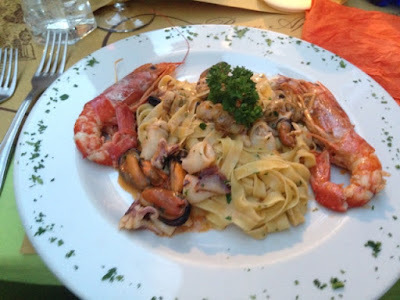 The entire affair lasted until well into the evening, and we were left only with time for a short stroll to Piazza St Michele before we drove back to the hotel at midnight, replete.